When we developed the Oculus Rift VR Lens Lab adapter we had access to three Oculus Rift headsets and the adapter worked fine in all of them. After we shipped the Kickstarter orders some people had problems with their adapters that became a bit loose and didnt stay in place well enough. We tried the adapters on more Oculus Rift once they became available and Oculus caught up with shipping orders and there are minimal differences in Oculus Rift sizing that do make a difference. So the same adapter that works perfectly fine in one Oculus Rift might sit a bit loose in another one. In the last weeks we worked on a solution for this and we are happy to send out free spacers to everyone who experienced this kind of problem. All new orders will ship with these spacers too. You simply clip them into your existing adapter and put the adapter in like you used to do. See the short video below on how this works and head over here if you experience this problem and want to get a spacer. If you experience any problems with the fit of your Oculus Rift lens adapter you can head over here to fill out the form and we send you a spacer for free. The huge majority of people were really happy with their lenses but a few people had problems with barrel distortion and getting used to it. Some people also asked why we flipped the lenses in our adapters. The reason is to avoid the lenses to touch and possibly damage your VR headset lenses and also sit as close to the headset lenses as possible for maximum FOV and clarity. There is more to that and we explain this in the video below and also introduce our new RABS lens technology. While not necessary for most people we are happy to offer our new premium RABS lenses that are based on the aspherical freeform technology that minimizes any kind of distortions. We offer these new lenses in our shop now as an optional upgrade if you order a new adapter. If you only want the RABS lenses to use in your current adapter you can fill out the custom request form here and we send you a price for the lenses only. For VR to be the best it can be, for it to be life-changing, there are a few key ingredients that need to be mixed just right. If done correctly, a developer can deliver what his colloquially termed, presence. That is, the ability to take you somewhere other than where you really are, and trick your mind into believing it. These ingredients include, but may not be limited to, high framerate, high screen refresh rate, high resolution, high pixel fill density, low persistence, and field of view (FOV). This article will focus on FOV. What is the Field of View (FOV)? Field of view, or the extent of the observable environment at any given time, is one of the more important aspects of virtual reality. The wider the field of view, the more present the user is likely to feel in the experience. 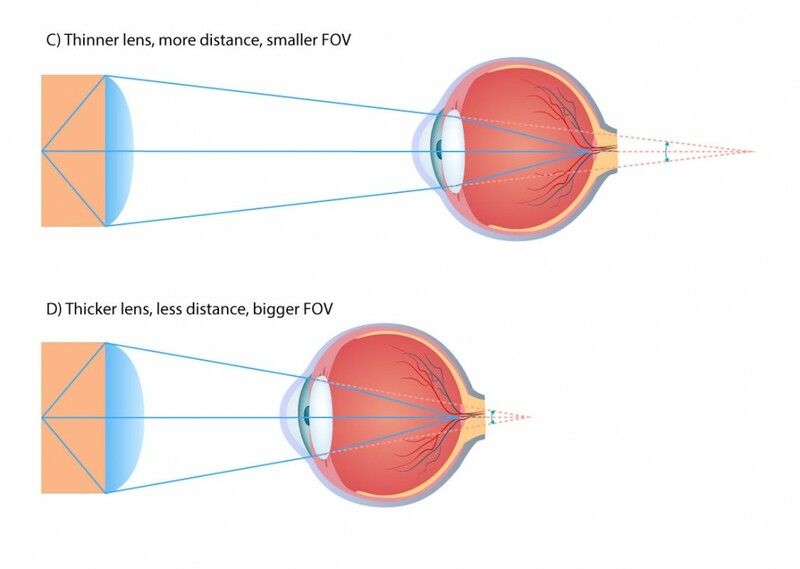 There are two types of FOV that work together to form human vision. 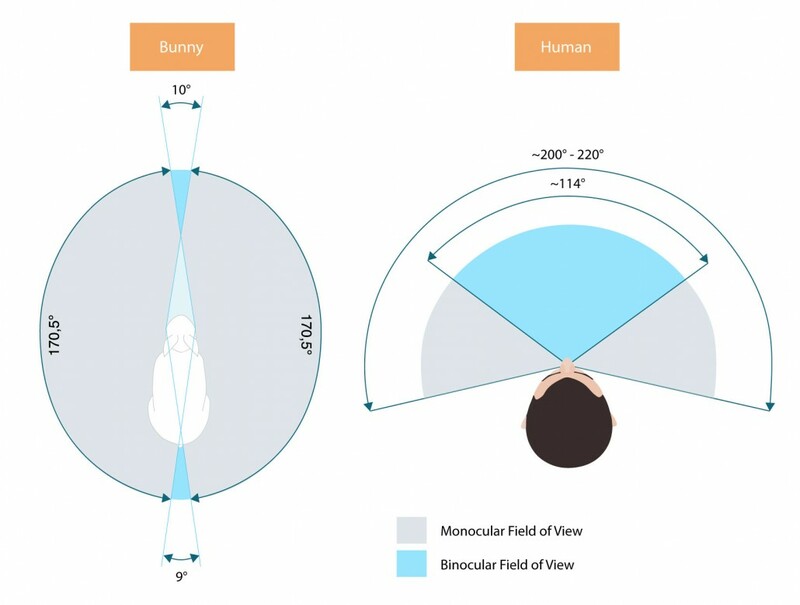 Monocular FOV describes the field of view for one of our eyes. 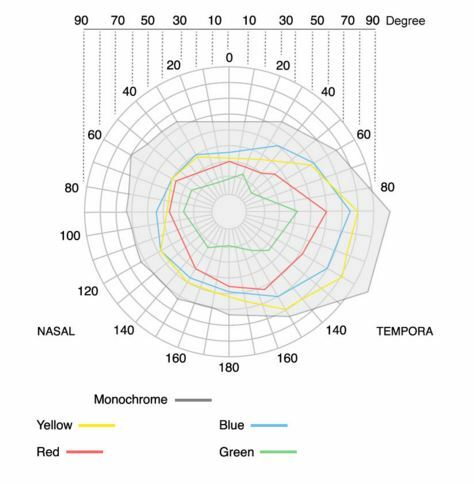 For a healthy eye, the horizontal monocular FOV is between 170°-175° and consists of the angle from the pupil towards the nose, the nasal FOV which is usually 60°-65° and is smaller for people with bigger noses, and the view from our pupil toward the side of our head, the temporal FOV, which is wider, usually 100°-110°. Interesting fact is that we have different field of views for different colors. Binocular FOV is the combination of the two monocular fields of view in most humans. When combined they provide humans with a viewable area of 200°-220°. Where the two monocular fields of view overlap there is the stereoscopic binocular field of view, about 114°, where we are able to perceive things in 3D. While a wider field of view is important for immersion and presence this stereoscopic binocular field of view is where most of the action happens every day and also in virtual reality headsets. Our brains have three pretty ingenious ways of understanding depth in the world around us. If we have knowledge of the size of an object, we can get a good idea of how far away it is based on how large it appears to us. For example, a car that you are standing beside will appear larger than a car that is across the parking lot. Also, things that are farther in the distance move across our retina slower than things that are close by. If you watch out your car window, the trees in the distance look almost stationary, but the road signs are going to fast that if you blink you miss them. And finally, our eyes are placed about 64mm apart, sending different images to our brain which combines them into a single, 3D image. The greater the disparity between the to images, the greater the effect, so objects that are closer appear to have a lot of depth and objects that are far away can appear flat. When it comes to VR FOV the limiting factor is the lenses, not the pupils. To get a better field of view you either move closer to the lenses or increase the size of the lenses. Companies like Oculus and HTC want to make the lightest and smallest headsets possible for ergonomic reasons. Here are some of the considerations VR headset manufacturer have to think about. 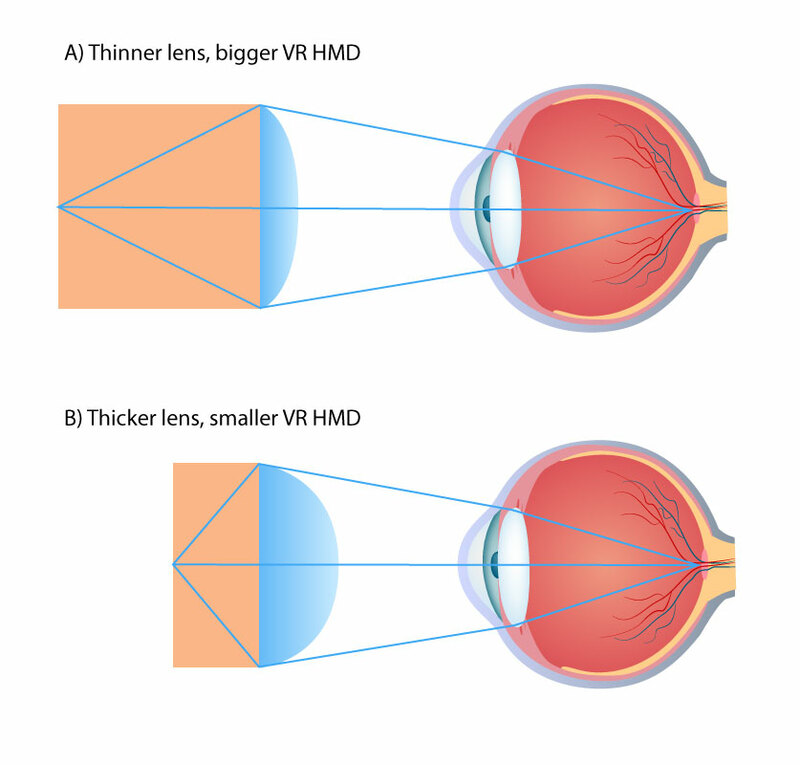 You can use thin lenses that are light in your VR headset but this will increase the distance you need to have from the lenses to the VR headset display and thereby the size of the headset (A). You can use thicker lenses (with a shorter focal length for a stronger magnification) and move the display closer but those thicker lenses add new engineering challenges to keep geometric distortion and chromatic aberration under control. Due to the stronger magnification a higher resolution display is needed as well to avoid or reduce the screendoor effect (in which you see individual pixels) (B). Another option if you want to keep the headset at a fixed size is to add more distance between the VR headset lenses and the user’s eyes (C). This reduces the FOV and is not desirable as well so what we see right now is mostly smaller headsets with thicker lenses that are fairly close to the user’s eyes (D). A different way of increasing the FOV is using bigger lenses with a larger diameter but this comes with its own set of challenges. Larger lenses need to be thicker in the middle which makes them heavier. This problem can be overcome by using Fresnel lenses but the second problem that remains regardless what kind of lens is used is that larger lenses introduce more optical aberrations. When you build a virtual reality headset you need to consider all these factors to maximize the FOV without making the headset too big or heavy and maintaining the best visual experience for the user. Current solutions for FOV used by Oculus, HTC and Pimax. Oculus, largely believed to be the leader in the VR headset game, used standard magnifying lenses on their development kits, which allowed for a roughly 90 degree FOV, with large amounts of image distortion building up as you moved your eye farther from the center. They have invested a lot of time and money into custom hybrid Fresnel lenses. 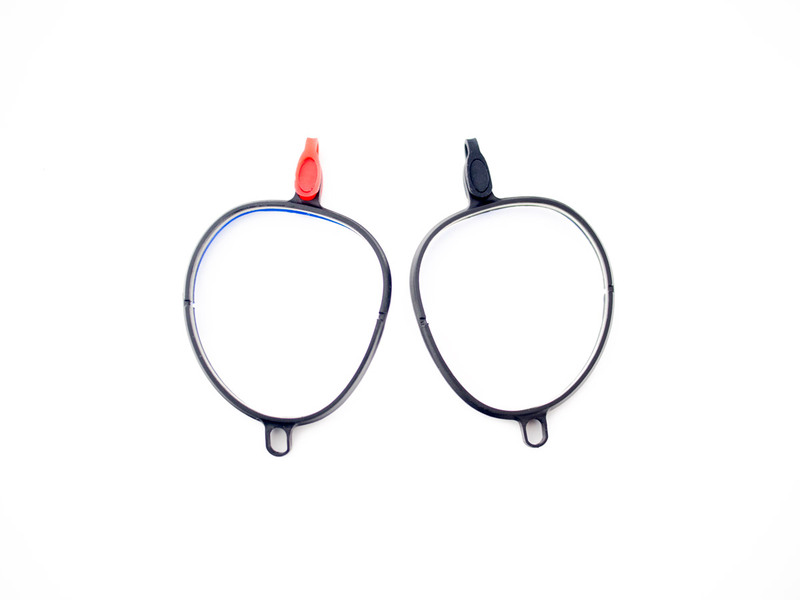 They have also added in a mechanical interpupillary distance (IPD) adjuster which will allow for everyone to get the clearest image possible, regardless of the distance between their eyes. Fresnel lenses are ridged and produce light ray artifacts where the light from the screen reflects off of the ridges and creates a sort of halo on the image. In the early kit there was an artifact known as Mura, which made the image seem to be overlaid with an ultra thin black linen material. While the light ray artifacts remain, HTC implemented what it called Mura correction, a way to improve the clarity of the HMD displays. Valve executive Chet Faliszek was unwilling to talk about exactly how Mura correction worked in a conversation with Tom’s Hardware, other than to say that it involved every aspect of the display system, nor would he address whether the technology had any impact on system latency. In late 2017 Pimax unveiled a new headset with a staggering 200 degree FOV. It is yet to be seen how how these will work in practise as changes are still set to be made before the 2018 release however comments from early prototypes suggest their may be major issues as Pimax are not using lenses with correctable geometric distortion. This means that corrections may need to be made specifically for this headset by each software developer. This being said, as of December 2018 Pimax have already pushed back the expected ship date for their backers citing design changes that still need to be made. We hope this gets you a better idea of what challenges manufacturers face when designing the lenses and ergonomics of their virtual reality headsets. If you liked this article subscribe to our newsletter for more.